Surprisingly, only the pickle has suffered the onslaughts of time. Man claims he's kept this McDonalds burger for 14 years. A MAN WHO claims he has saved a McDonald’s hamburger since 1999 has gone public with his at-home experiment. The sandwich looks nearly identical to when David Whipple, from Utah in the USA, bought it. He went on the television show The Doctors to talk about his experience. Whipple initially decided he was going to save the burger for two weeks to show his friends. Then, he totally forgot about it. Two years later, he found it in the coat pocket, along with the original receipt. Despite two years spent in a closet, the sandwich showed no signs of rotting or mould. He decided to keep the burger to see how long it took to disintegrate. Whipple told The Doctors that he uses the burger to encourage his grandchildren to eat healthy. “It’s great for my grandkids to see. To see what happens with fast food,” he said. McDonald’s has explained this phenomenon before on its website. 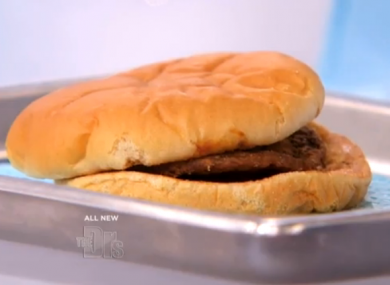 Email “This is what a McDonald's hamburger looks like after 14 years”. Feedback on “This is what a McDonald's hamburger looks like after 14 years”.